Even in this day and age where all our grandmas complain that our noses are perpetually in our phones, meeting people in person is still the best way to grow the strongest social media network. That’s not to say that you should grow your social media presence with only real-world networking. Online versus in-person networking: one cannot replace the other. It’s a combination of both that will work the most effectively. In healthcare, there is conference culture that is ripe for social media networking. At these events, you will meet with all sorts of people active on social media in the field, such as bloggers, influencers, marketers, and healthcare workers. So how do you make connections at these events most effectively? 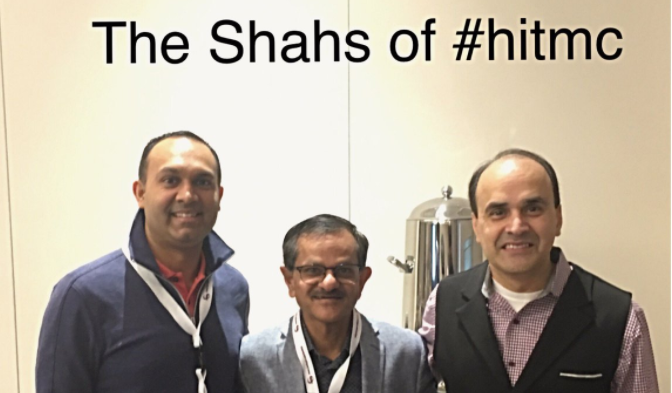 Our President, Chintan Shah, networked in person at the last #HITMC conference and met two doctors who also had the last name "Shah." He took the opportunity to take a picture of all of them together. The tweet of the pic turned out to be one of the most popular on the conference's hashtag, and all the Shahs follow each other now on Twitter! I’ll give you the answer right now, so you’re not even tempted to ask it: they produced quality content, posted consistently over a long period of time, and hustled relentlessly. DO compliment someone’s social media account, especially if you’ve been following them for a long time. Choose something specific to comment on that shows you’ve been paying attention, whether it’s a blog post you’ve read or a piece of graphic content you liked. DON’T ask someone how much they got paid for a sponsored post. We’re all curious about the rates in this burgeoning field, but save that discussion for an appropriate forum. Also don’t ask them to “hook you up” with a brand. It comes off as opportunistic and ends up being a turnoff. DO ask them behind-the-scenes questions or about their experience working on a specific campaign. You can also mention some of your projects or goals and things you’ve been doing to achieve them. DON’T ask someone to follow your account. You can give them your card or ask to follow them. Many people try to keep their following number low and for whatever reason, you may not make the cut for a follow back. Don’t take it personally. DO take a great picture of people with whom you wish to connect. Make sure you get their @ so you can tag them later. Showing up in each other’s feeds helps your networks on many levels. DON’T let your momentum stagnate. Within 24 hours of the event, send a DM to the people with whom you had a good connection, making a reference to the conversation you shared. Chances are, you both met a lot of people and this will make you stick out in each other’s minds. DO continue to engage. Make an effort to like and comment on your new connections’ posts. Even big accounts notice their consistently engaged followers and appreciate the love, and having met you in person strengthens that bond. Do you have any tips for in-person networking for a social media network?